When I consult with someone about creating a website or blog, one of the issues that comes up is purchasing a domain. The ideal scenario would be to purchase your company or brand name at its .COM extension, but now days, a full several decades into “The Internet”, you’ll find that many .COM extensions are taken, especially for popular terms and phrases. In cases where people actually do find their preferred .COM domain, the next issue is how many years should you purchase it for. Meaning, how many years are you going to pay for now, before it’s time to renew your domain again, typically at whatever the “then current” renewal rate is. Allow me to back up a little bit here and explain how domains work. A domain is like a telephone number. Once you acquire it, as long as you pay for it (typically to a domain registrar) it belongs to you. When you stop paying for it, or cancel it, or allow it to expire, just like with phone numbers, it goes back into the pool of available domains that someone else can then purchase. So in this respect, when confronted with purchasing a domain, I typically tell my clients to purchase their preferred .COM domain for as many years as they can afford. Most companies, like GoDaddy, will allow you to purchase your domain at a set price and they’ll offer that same price for multiple years. For instance, this current GoDaddy Domain Sale offers .COM domains for $7.49/year, which means that you can purchase your domain for several years, say 5, and pay about $37, as opposed to what you’d pay if you purchase it for just one year at $7.49, then renewed annually at whatever the current rate was at your domain registrar. I use the example of a $10 domain on my company’s website (see the image to the right), because I think that gives us good clean numbers to work with. In the example, the domain starts off at $10 per year, and the price of a renewal increases annually by 20% (which is on par with the industry standard). 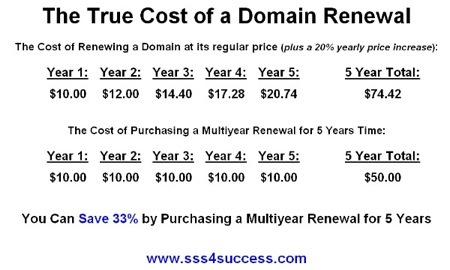 Purchasing the domain the first year at $10, then renewing it annually at its current rate would mean you’ll end up paying a total of $74.42 over a five year period. Whereas, if you purchase the $10 domain for five years, you’d have spent $50 upfront and essentially saved about 33% by making that purchase when you first acquired your domain. It’s a fairly simple transaction, but a great way to save money, especially in the early years. Add to that the confidence that you have in your brand, and it’s definitely a worthwhile investment. One other tip I’d like to add is this: If you’re fortunate enough to acquire your .COM domain when you first start off, buy all of the other domain extensions like .NET, .ORG, .MOBI, .INFO, .BIZ, and even the newest .CO that you can afford, in addition to any common misspellings, if you can afford those too. Do this to protect your brand, because there is a whole industry of people that make their living off of buying similar domains of popular brands and either re-selling them to you at a premium rate, re-selling them to your direct competitor, thus siphoning off your web traffic, or worse, positioning themselves as you, under a very similar domain name, and infringing upon your brand name in that way. Just some tips and advice that I hope helps make the Web 2.0 environment a little less intimidating.